Wolfgang Amadeus Mozart - Piano Sonata in C Major, K. 309 (284b) composed by Wolfgang Amadeus Mozart (1756-1791). Edited by Ernst Herttrich. For Piano. Henle Music Folios. Softcover. 21 pages. G. Henle #HN1065. 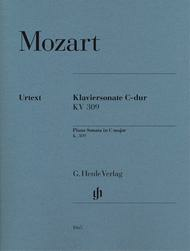 Published by G. Henle (HL.51481065).Previously only available in the complete volumes, Mozart's K. 309 is now available in a convenient single edition.